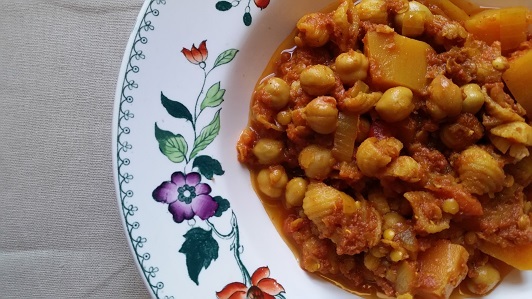 This North African squash and chickpea stew recipe comes from “River Cottage Veg Everyday” by Hugh Fearnley-Whittingstall. This is definitely the recipe book I have used most often over the past 4 or 5 years since it came out. There are still loads of recipes in there that I haven’t tried but most of the ones I’ve done I come back to time and time again. 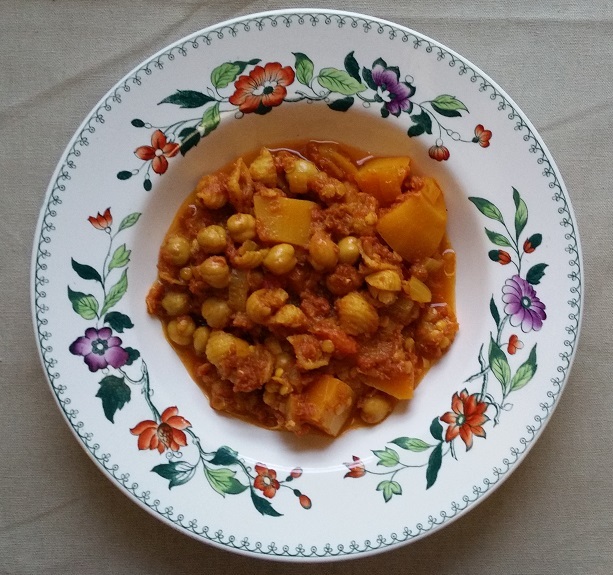 As well as this North African stew, other favourites have included the warm salad of mushrooms and roasted squash, a chilean squash and bean stew called porotos granados, mushroom stoup (not a typo, a cross between soup and stew! ), white beans with artichokes, pasta with fennel, rocket and lemon and the inspired macaroni peas. The only one I’ve done that I didn’t particularly enjoy was the squash stuffed with leeks. Suffice to say that I highly recommend this big book of tasty, everyday vegetarian dishes! Two main reasons why I love this particular stew: It smells fantastic when you’re cooking it and the lentils and pasta give it a really interesting texture. You can use any small pasta in this recipe. One of the suggestions is orzo but I prefer it with something a bit more substantial. I had some really nice mini tortellini that my friend Tara bought me and since they’ve run out I’ve been using mini pasta shells from Morrison’s own brand. It’s also one of those dishes that makes you feel properly nourished, especially on a cold winter night, and it freezes well. The inclusion of a significant amount of ground black pepper (the book specifies freshly ground but I always use ready ground in this) is really interesting and gives it a nice kick. I have made a few little tweaks to the recipe but it’s fairly true to the original. I include red pepper because I had some to use up and it worked, while I omit the celery, saffron and fresh parsley because I rarely have them in and wouldn’t buy them just for this. It simplifies the recipe and the ingredients list a little but still tastes fantastic. Hugh Fearnley-Whittingstall recommends serving dates on the side but anyone who knows me will tell you I am avidly not a fan of fruit in savoury dishes but feel free to go ahead 🙂 I do think the fresh coriander works really well on this but if you’re keeping costs down (or you are one of the people for whom fresh coriander tastes like soap) it isn’t essential. Heat the oil in a large saucepan and fry the onion for about 5 minutes until starting to brown on the edges. Add the garlic, red pepper, black pepper, turmeric, cinnamon and ginger. Stir well and fry for a couple more minutes. Add the red lentils, chickpeas and passata, bring to the boil and simmer gently for 15 minutes. Add the butternut squash, stock and bay leaf and simmer, covered, for a further 30 minutes. Add the pasta and simmer until it is cooked (about 5-10 minutes). Serve scattered with fresh coriander leaves.